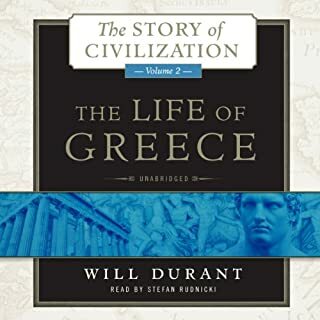 Here Durant tells the whole story of Greece from the days of Crete's vast Aegean empire to the final extirpation of the last remnants of Greek liberty, crushed under the heel of an implacably forward-marching Rome. 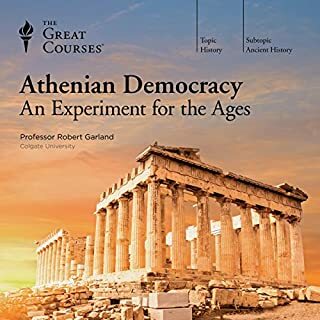 The dry minutiae of battles and sieges, of tortuous statecraft of tyrant and king, get minor emphasis in what is preeminently a vivid recreation of Greek culture, brought to the listener through the medium of supple, vigorous prose. The third volume of Will Durant's Pulitzer Prize-winning series, Caesar and Christ chronicles the history of Roman civilization and of Christianity from their beginnings to A.D. 325. The fourth volume in Will Durant's Pulitzer Prize-winning series, The Age of Faith surveys the medieval achievements and modern significance of Christian, Islamic, and Judaic life and culture. 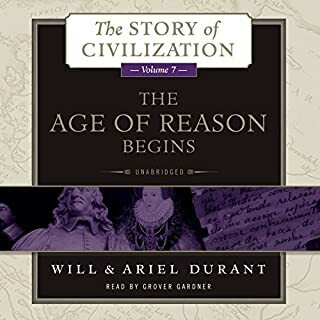 Like the other volumes in the Story of Civilization series, this is a self-contained work, which at the same time fits into a comprehensive history of mankind. It includes the dramatic stories of St. Augustine, Hypatia, Justinian, Mohammed, Harun al-Rashid, Charlemagne, William the Conqueror, and many more. 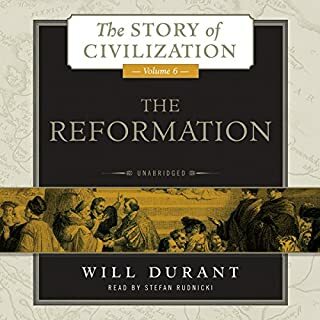 An engrossing volume on the European Reformation by Pulitzer Prize-winning historian Will Durant. 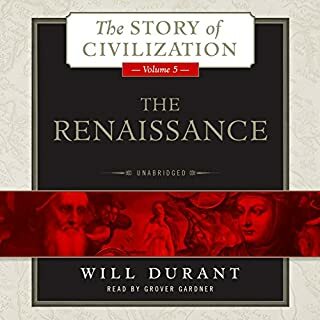 The sixth volume of Durant's acclaimed Story of Civilization, The Reformationchronicles the history of European civilization from 1300 to 1564. In this masterful work, listeners will encounter: the poets Petrarch and Boccaccio, the fathers of the Renaissance; the paintings, sculptures, and architecture of Milan, Florence, and Venice; the life and accomplishments of Leonardo DaVinci; the Catholic church and the popes of Avignon and Rome; the politicians and philosophers of Italy, including the Borgia family, Julius II, and Machiavelli; the Italian Wars, the conflicts with France, and the country's decline. 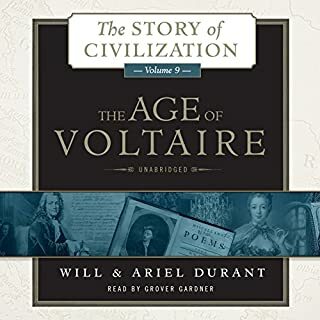 The Age of Voltaire, the ninth volume of The Story of Civilization, is an in-depth examination of France and England in the first half of the 18th century. 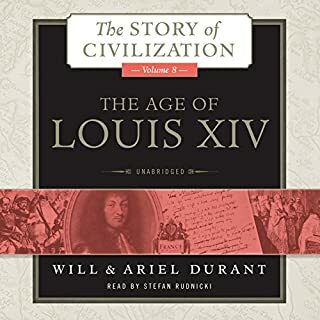 The Age of Louis XIV is the biography of a period (1648 - 1715) that Spengler considered the apex of modern European civilization. "Some centuries hence," Frederick the Great correctly predicted to Voltaire, "they will translate the good authors of the age of Pericles and Augustus." Those authors are lovingly treated here. 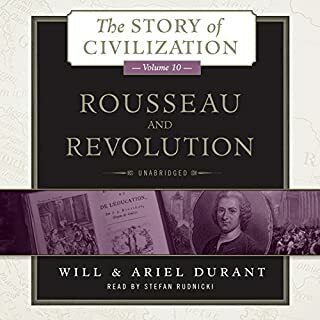 Rousseau and Revolution, the 10th volume of the Story of Civilization, ranges over a Europe in ferment, but centers on the passionate rebel-philosopher Jean-Jacques Rousseau, the great exponent of the romantic impulse toward self-exploration and social revolt, who contended with the great rationalist Voltaire for the mind of Europe. 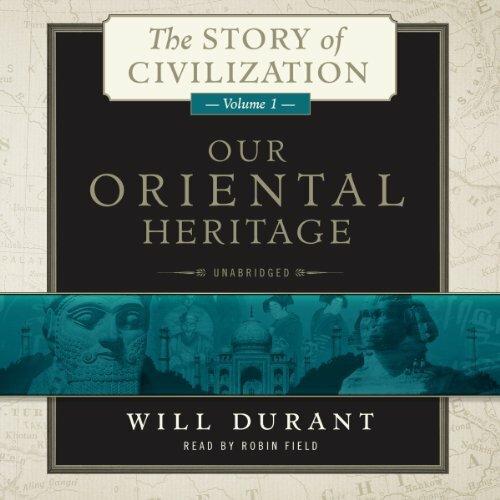 ©2013 Will Durant (P)2013 Blackstone Audio, Inc. I would recommend this book to those of you who already have some knowledge of ancient history. I read this series years ago, then listened to them on cassette tape, and have begged for them on Audible for many years. Finally, the first two have appeared. No history is perfect, and history written in the forties cannot help but be dated, yet the authors’ presentation, tone, and focus seem surprisingly up to date. I really like the authors’ quirky sense of humor and matter of fact tone. This series is eleven big volumes totaling something like 500 hours. 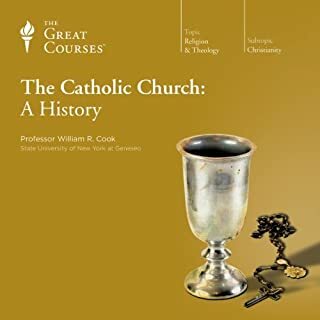 This history is very easy to listen to and it is hard for me to imagine anyone who would not find a lot of it interesting. Some people dislike the somewhat thematic instead of chronological approach, but I found it engaged me more than most histories. Persians and Chinese may be rightfully chagrined at the short shrift given their influential cultures and I agree with those who argue that the authors focus on exceptional individuals and deemphasize the importance of randomness in history. Nevertheless this is a series that I would recommend to anyone over twelve that wants to learn about western history. For me this was hundreds and hundreds of hours of fun and I did a little dance when I saw these were now available on Audible. Frankly none of the narration is perfect, but Robin Field does a good job in this volume. 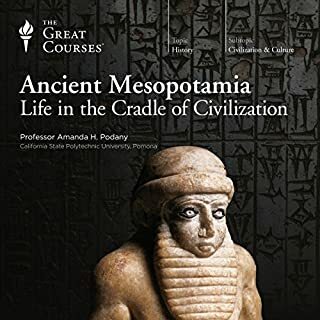 This volume covers pre-history and the invention of language and art up to the ancient eastern influences on western civilization. Selfishly I want to encourage people to listen to these first two so Audible will get the rest of the series. One of the great books on Eastern Civilizations. 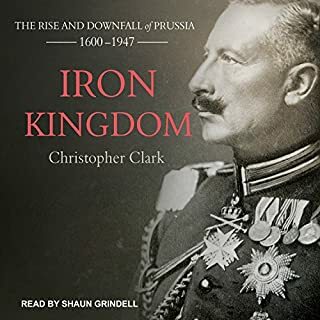 This book is a perfect listen for those who don't like history with all of its dates since he tells the story functionally not chronologically. The book looks at history by each civilization and by function (philosophy, poetry, prose, people's language, government and so on). The author seems to excel when he's talking about a country's philosophy and uses it to describe the country's culture. The section on Buddhism, Hinduism, and Confucianism are the best I have ever read. It's hard to condense 2000 or more years into a digestible understandable format, but the author does it and the listener really gets to understand our place in the universe a little bit better because of it. The author magically takes random events, turns it into information, processes it into knowledge by giving it narrative and then gives the listener wisdom he didn't have before. I did smile out loud when we were told about Akbar the "illiterate intellectual". He would have the great works of his time read aloud to him. After having listened to this work, I too feel like the illiterate intellectual (since reading puts me to sleep and listening does not. Thank you Audible for making this book available!). I will give a bit of advice to any potential listener that I know I wouldn't follow myself (my favorite kind of free advice). Don't listen to the first eight hours or so of the book on prehistoric man and early prehistory. He's just wrong and full of prejudices of the time. I did listen to it because I have a linear personality and just can't bring myself to not listen to it all, but the only value I got is that how little they knew about that period of man in 1935 and how they would extrapolate falsely and a boatload of the author's Western prejudices sneaked through. I would be amiss to not comment on some of the incredibly absurd statements that permeate the book (meat eaters stink, "the average Japanese man today has the sensitivity and shrewdness of the Jew", Hindus are a superstitious people, and so on). I would recommend just ignore such statements and take the book as the masterpiece it is. I have yet to find any other book that covers Eastern Civilizations better and I definitely will read the other volumes in the series. Two caveats. This first volume was written in the 1930’s so some of its information is inevitably dated. 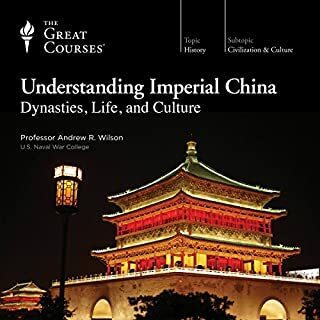 Secondly, this book is really more about giving the Eastern context necessary for understanding Western civilization than a comprehensive guide to Eastern civilization. That being said, it is a beautifully written history, alive with detail, with generous amounts of quoted literature giving the testimony and mindset of the people who lived through these times. One thing I like about Durant’s approach is that while he is always lively and opinionated, he doesn’t create strawmen. He is always sure to present the best case for differing points of view. It would be nice to see more of that quality in these polarized times. This was thoroughly enjoyable to listen to. A must listen by anyone. This book was written in the 1930's and it needs to be updated. Other than that, this book is one of the best history books ever written. This 11 vol. World history is without peer- and is one of the greatest works by any measure In history - and on history. I had asked audible to get it when I saw it became available and it wasn't anywhere on their radar. I assumed they (the one who just released the first book-recorded books I think) would either use the one that was around on tape - that had already been done by the incomparable Grover Gardener or at least use someone else of his caliber and suitability for the material as well as being appropriate for such a stunningly important work. What we got was a huge disappointment. The narrator was not suited to the material-at all, and I should know seeing as( very roughly) 300 of my 900 books are history. 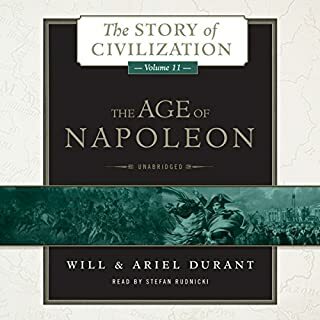 Ive been after this series in audible format for 5yrs and while I sincerely thank audible for their efforts in bringing these titles on board It has been a huge let down. Its not audibles fault though. Audible has really been great, not just for getting this(despite it being a disaster) but also other things Ive requested like the 2 missing books from Robert Caro's years of lyndon johnson biography which by the way was done marvelously by them. If you havnt read that multi-volume biography your life is incompleate! Audible if your listening-this 11 vol masterpiece is out there on tape by grover gardiner(though he uses anouther name- Alex Alexander or something like that) Just waiting for you to pick it up re-master it and put it out there. Tongues are hanging out in anticipation of someone doing this! 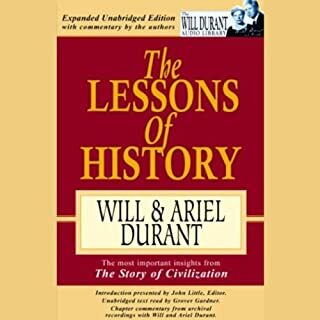 I imagine this volume had to be the most difficult for Will Durant to produce because of its timeline. He begins his work brilliantly by explaining mankind's apparent need for familial safety and how a family grew to a tribe, from a tribe to a village, village to city, city to state, state to nation, etc. As more people join a culture, though, tasks can be distributed evenly among the citizens, giving some folks a leisurely time to create what came to be known as art or science and, since they were the possessors of such beautiful things, they came to be set at a higher standard, creating caste systems and such cultural labels that are still seen today. Robin Field is an amazing narrator with no misunderstanding of sentence structure or diction. I understood him quite clearly and his telling of quotes and notes was fantastic! 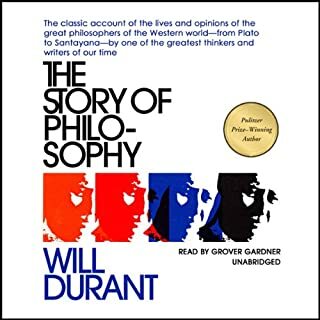 I can already tell that I'm going to very much enjoy these volumes by Will Durant as well as anything else Robin Field narrates in the future! This book is a prized possession! The Eighth Wonder of the World is This Series. If you could sum up Our Oriental Heritage in three words, what would they be? Valuable information no person should have to live without. Ignorance when one is part of civilization, about the civilization one lives in, is an unnecessary burden. One does not have the big picture until they understand the cultures one has risen from. Your understanding of mankind just grows in leaps and bounds as you are taken through this marvelous adventure of our beginnings. I read the series when it was introduced as a book club incentive in the mid 80's. It was just a great read. Magical! Not like reading a history book at all. Hugely entertaining. When they were published on cassette I had to listen again. Now on audio book, it has been just as great the third time though! The best yet! Have you listened to any of Robin Field’s other performances before? How does this one compare? There is humor and wit in the writing that is very subtle. Don't deny yourself this extraordinary adventure of mankind! I enjoyed the big picture presented with clarity. I got engaged to the book. suddenly, the book was over. I love this book. I'm not an expert to criticize the book professionally but I like it.. 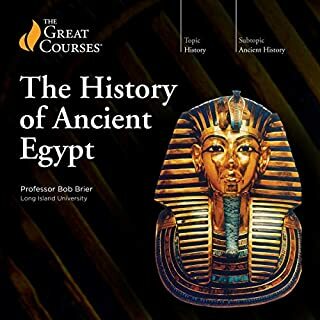 I feel that the book goes over every important detail of the Era tackled in this volume the narrator is good and talks clearly.. English is a second language to me yet I easily understand him.. starting volume 2 soon! !